1st LT Thomas D. Chenault was born 16 May 1946 in Gonzales, Texas. He graduated with Ranger Class 8-70 in March 1970. He was initially assigned as an Airborne Rifle Platoon Leader in the 82nd Airborne Division at Fort Bragg, North Carolina. He was later reassigned to the 101st Airborne Division (Air Assault) for a tour of duty in South Vietnam. 1Lt Tom Chenault served as an AERO Rifle platoon leader in Delta Troop 2/17th Air Cavalry of the 101st Airborne Division from July 1970 until April 1971. The 2/17th Cavalry and L Co 75th Infantry Rangers were the 101st Airborne Division's Reconnaissance Force, operating in the Division Recon Zone and exploiting targets of opportunity. 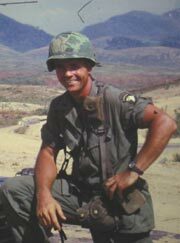 During this period 1Lt Tom Chenault led numerous combat assaults deep into hostile NVA controlled territory. Tom and I developed a close friendship and went on many of these missions together. On 24 April 1971 a six man Ranger unit, Ranger Team "Cubs" of L Co 75th Infantry Rangers was conducting a radio relay mission for another Ranger team operating in the Ashau Valley, Thua Thien Province of Northern I Corps. Ranger Team "Cubs" became involved in heavy enemy contact with a large element of North Vietnamese soldiers on a hill overlooking the eastern side of the Ashau Valley at Grid Coordinates YC 484 924. 1st LT Tom Chenault, only hours after having returned from R&R leave in Hawaii, unhesitatingly volunteered to lead 3rd Platoon D Troop 2/17th Cavalry on a reaction force mission to rescue and assist the surrounded Ranger Team. Upon insertion, Tom lead his platoon to a point near where the Ranger team was in an intense fire fight with the enemy. 1LT Tom Chenault and his platoon were soon engaged in heavy enemy contact also. His point man was hit by enemy small arms fire. Reporting the situation by radio, Tom requested air support and medevac for the wounded soldier. Later moving forward to further explore the situation, Tom was mortally wounded by enemy fire. The enemy fire was so intense that three helicopters were later shot down and an Infantry Battalion was inserted to attempt the rescue. It finally took a hand picked Ranger patrol with heavy air support to reach the Ranger Radio Relay team. It is with great pride that today, 34 years later, we honor RANGER Thomas D. Chenault at the Fallen Ranger Memorial.